Guanyin Mountain (觀音山) is a 616 meter tall extinct volcanic mountain in New Taipei City that is ecologically diverse and has excellent panoramic views of the Danshui River as well as the Taiwan Strait. The mountain is commonly frequented by hikers, bird watchers and families enjoying their weekend. It was named after the Buddha of Compassion who in Chinese-speaking countries such as Taiwan, China, Singapore and Malaysia is a female Buddha known as Guanyin (觀音). There’s an old saying in Taiwan that if you look at Guanyin Mountain from the Danshui side of the river that it looks like the Buddha Guanyin lying down. Personally, I don’t see it, but in Taiwan, you will come across many places where imaginative people who have partaken of just the right amount of rice wine have seen images in rocks that they think look like something else. I’m exaggerating of course, but there are quite a few tourist spots in this country where you will be told that a certain rock looks like something else and your neck will hurt from trying to see the resemblance. There are over nine different trails available for hiking on this mountain and each trail is well maintained and they are all relatively easy to navigate as well as hike. 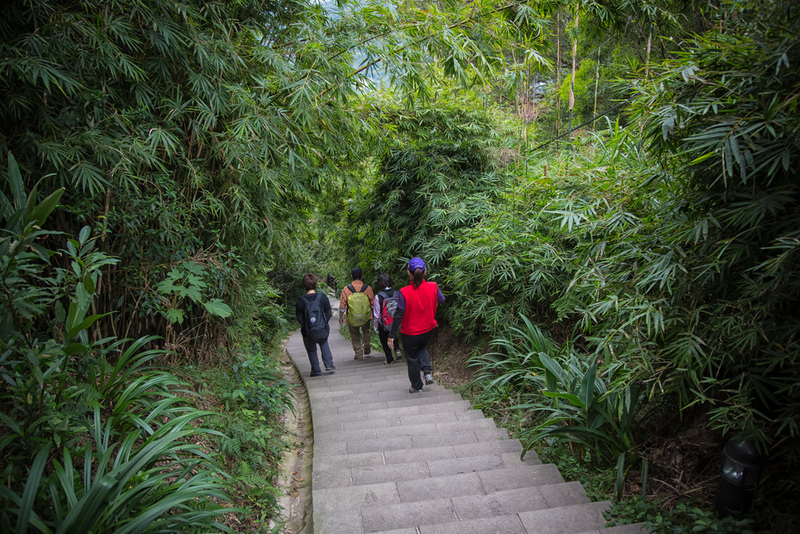 The trail I took on this specific occasion was the Ying Han Ling trail (硬漢嶺步道) or the “Tough Guy Peak” which was named because it was used in the past for military training exercises. I found out quickly why it was called the “Tough Guy Peak” because right from the start of the trail, it's all very steep stairs and is pretty hard on the legs going up. At all trailheads in Taiwan you will be see a sign that tells you that it will take a certain amount of time to complete the hike. As a general rule when I see these signs at a trailhead, I divide the time by at least half or three quarters as I think they measure time on these trails by how quickly senior citizens move. The weather in Taipei is notoriously hazy during the Autumn and Winter months and the available light for photographers isn’t the best, so even though the forecast wasn’t calling for rain, we knew that when we reached the top of the peak, it wasn’t likely that we would have a great view. The Ying Han Ling peak is renowned for giving excellent panoramic views of Taipei City as well as the northern coast and the Taiwan strait. Of all the peaks I’ve been on in Taipei, its one of the most scenic and probably less photographed than some of the others. After we finished the hike we had a bit of extra time, so we drove over to check out a little park dedicated to Guanyin. There wasn't much there other than the statues and another trail heading down to a temple. So we didn't stick around very long and made our way back to Taoyuan. I enjoyed my time on this hike and I will definitely try to go back on a sunny day to get more shots on the peak as well as trying some of the other trails. This hike was extremely easy, the trails are well developed and their are lights following the trails if you happen to stay later or want to get night shots of the city. Anyone can do this hike and you don't need anything special to do it other than a bottle of water and a camera. And now for a bit of a rant.. This is a mountain, its not a dumping ground for your unwanted pets. Seeing dogs on a mountain is a common sight in Taiwan, but I don’t think I’ve hiked a mountain in the Taipei area where I’ve seen so many abandoned and extremely human-friendly dogs. An old habit among Taiwanese is that when a pet suddenly become a burden, they are loaded up into a car and then dropped off at a mountain. Guanyin mountain seems to be Taipei’s biggest recipient of such irresponsible behaviour. There isn’t much for these dogs to live on in such an area and they all suffer from hunger and often injuries that will never be taken care of. Becoming a pet owner is a commitment for at least 10-15 years. If you’re not sure that you can commit that amount of time to a pet, you shouldn’t take one into your home just so that you can abandon it when it becomes a burden. Next time I go to Guanyin Mountain to hike, I’ll be sure to carry one or two less lenses and a sufficient amount of dog food to feed the poor animals that were helplessly thrust upon the mountain.